WE HAVE A BRAND NEW LINE OF BLANK GUNS NEVER BEFORE SEEN IN THE USA!! READ ABOUT IT BELOW!!!! VERY EXCITING GUYS!!!! December 24th, 2018: The New US RGC Showroom/Office we purchased in 2017 is completed.....A showroom to highlight our most impressive and interesting guns has been our wishlist for years.....When we can, we'll post pics right here. NEW GREASEGUN COMING VERY SOON: LOOKEEHERE!! 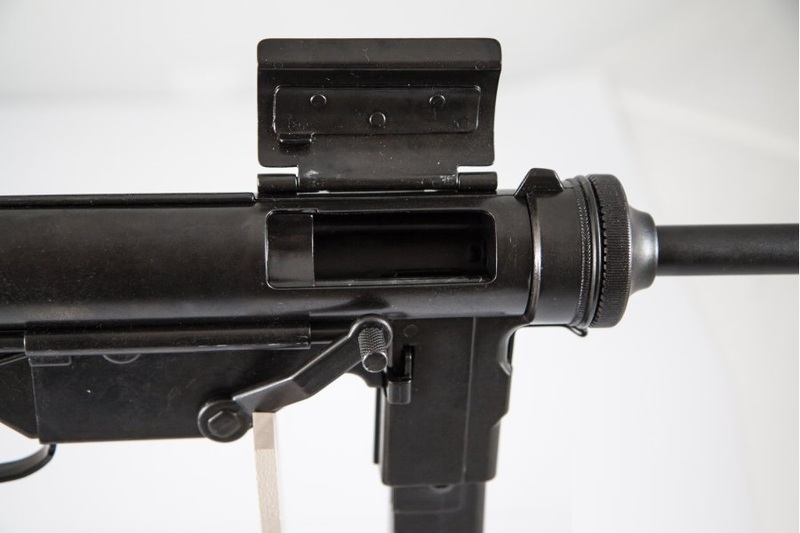 New from Denix, an M3 greasegun with the ejection port cover NOT molded open!! Awesome...COMING LATE OCTOBER 2018....IN STOCK NOW IN LIMITED QUANTITIES..WORKING CRANK!! WOW!! CALL US OR EMAIL FOR MORE PICS AND INFORMATION....WE'LL DO A YOUTUBE VIDEO SOON AS WELL!! WE ARE IMPORTING TWO NEW LINES, WITH SOME AWESOME MODELS!!!!! 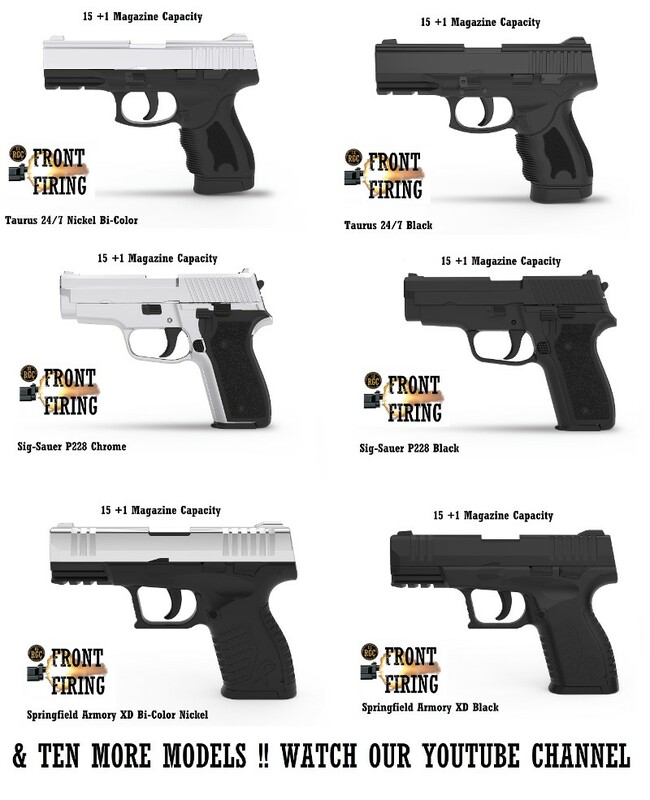 GUNS YOU HAVE NEVER SEEN BEOFRE LIKE THE Taurus PT-24/7, the Sig Saur P228/229, and the Springfield XD, a total "Glock-Alike" pistol US Collectyors have been looking for for years.....We already have the PT-24/7 !! Guys, this is HUGE!!! As for new Products, we always have goodies in the works. We have just completed our new Candy Bar Bomb, sometimes called the Chocolate Bar Bomb, as designed by the Germans in WWII. It's a devious little device that coated in real chocolate. Ours looks exactly like chocolate, and the system we are using has been perfected to the point that we just might make replica chocolate bars for WWII re-enactors! NEW VERSIONS OF THE C96 Mauser! 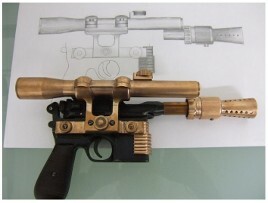 A revised version of the venerable C96 Mauser, with a wooden Stock, and a Han Solo Blaster!..WOW...All metal. The Sten Gun is here!!. Not a dummy gun, but a working bolt and trigger dummy gun. We have been waiting for this for years to replace our solid bolt STEN Dummy Guns! CHECK OUT OUR EXCLUSIVE SILENCED VERSION!! The Sharps Rifle is Available: Civil War Guys and it will be available in 2 versions. Carbine, and Rifle! We are very happy about this, those guns should be very good, and they should have been produced years ago. 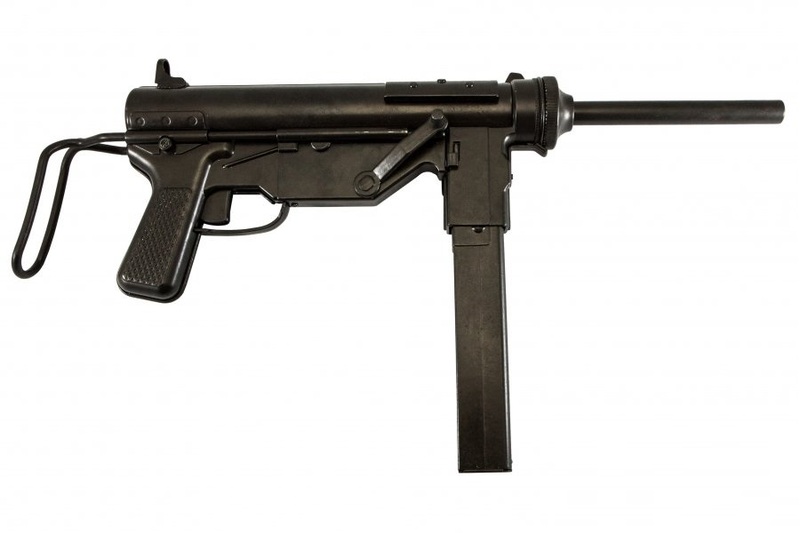 THE REALLY BIG NEWS IS HOWEVER: NEW ALL STEEL BROWNING M2 HB and AIRCRAFT MACHINE GUNS! These New Replicas were born from necessity. 2 other companies make replica .50's. One is steel, but the gun is uber-crude, and wait time is horrendous. That one sells for about 1,000USD. The Other Company sells an alloy M2, and the detail on this gun is good. It's a good looking gun. However......Since it's alloy, it can't be duracoated, they just use cheap spray paint. Second, the alloy cracks, and third, the alloy pits when converted to sim-fire configuration. 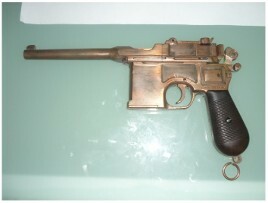 The price on that gun has also been raised to 1880USD!!! 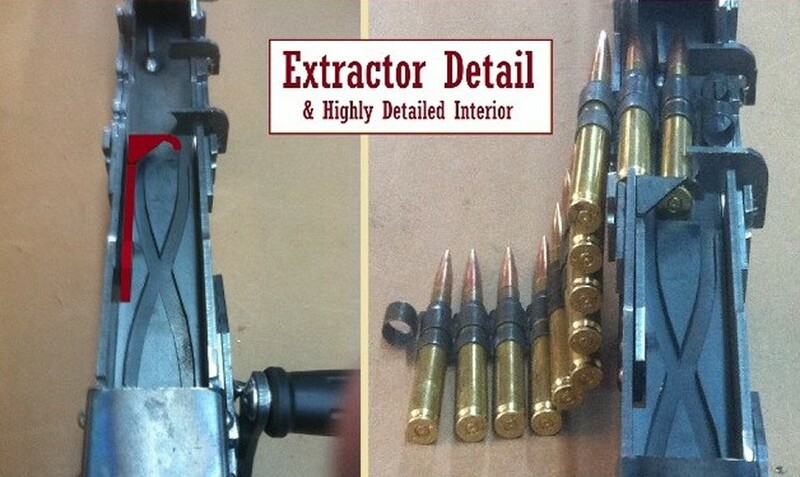 We have heard so many complaints about these guns from the Army, and the general public, we wanted to go one better. We did. We will be offering an ALL STEEL gun with great detail, expertly welded and finished with your choice of Bakelite or genuine wood grips and charging handles. for about 1500USD So you get the best of both worlds...reasonable price, all steel construction 1/4 inch sheet steel by the way!! 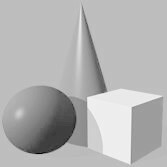 !, and all the detail that collectors require. Simply put, our goal has been to build a better gun, at a cheaper price. 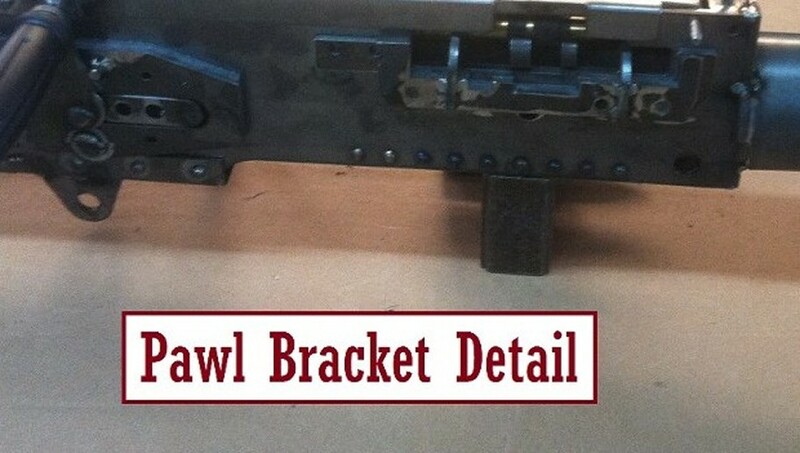 I think we did that, and the first batch of receivers are in production right now!......If all that weren't enough, the spade trigger will be spring loaded and move, AND the charging handle will rack under spring tension!! What gun is next? Well, just for the US Army (Also available to civilians) an ALL STEEL version of the Mk-19 40mm Grenade Launcher!.....great detail, all steel. Same function as the M2!! 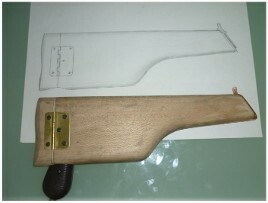 Check out the pics below!........The Below Pictures represent a gun before finishing. As of July 1st, 2015 The Acme Gun Group, has purchased the remainder of Keystone Arsenal Replicas. The Old KAR Website is gone, a new website will be built for KAR using the RGC website model. The United States Replica Gun Company, (RGC) www.ReplicaGuns.com, Our Flagship Store. Keystone Arsenal Replicas, (KAR) www.KeystoneArsenal.com, A site devoted to WWII Guns. Front Fire Blank Guns.com (FFBG) www.FrontFireBlankGuns.com, a site exclusively devoted to front venting blank guns.